The Club at Comanche Trace has a full service Pro Shop, offering a wide range of golf attire, golf equipment and club fitting services. Our seasonal apparel includes selected labels such as Peter Millar, Foot Joy, Ashworth, Adidas, Tail and Oxford. In addition, we can assist you with a special order for merchandise that features both your company's logo and the Club's logo. Our pro shop features vendors such as Footjoy, Oxford, Tail, Nike, Titleist, Cobra, Bette & Court, Scotty Cameron, Callaway, Mizuno, Ping, and TaylorMade. 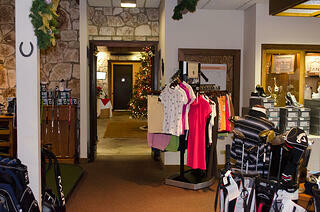 You may reach the Comanche Trace Pro Shop at 830.895.8500 ext. 1. Gift certificates are available at the shop and make a wonderful gift. We look forward to serving you!